Yesterday McDonalds filed court papers saying a lawsuit to prevent the company from continuing to include toys in Happy Meals should be dismissed because parents can choose not to buy their fatty wares. Plaintiff Monet Parham says the company unfairly uses toys to market unhealthy food to kids, thus promoting childhood obesity. The company counters that if Happy Meal toys are banned, "advertising to children any product that a child asks for but the parent does not want to buy would constitute an unfair trade practice." Parham's lawyer responds, "What is different about this motion is that McDonald's has chosen to blame the victim - saying that it's all Monet Parham's fault if she doesn't force her daughter to ignore the onslaught of McDonald's marketing messages. 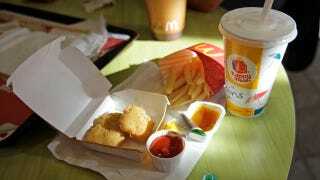 McDonald's makes a lot of money by going around parents direct to kids, and it wants to continue with that strategy."